Free Wi-Fi an onsite bar/restaurant and a heated outdoor pool await at the non-smoking Holiday Inn La Mirada 20 minutes from Disneyland. At this eight-story Holiday Inn 292 non-smoking rooms feature coffeemakers voicemail phones and free Wi-Fi while suites include sofa beds and microwave/mini-fridges. Check emails from the well-lit work desk or watch your favorite show on the cable TV. Beds are triple sheeted to ensure a sound night's sleep. After a full day unwind with a workout in the 24-hour fitness room followed by a relaxing swim in the outdoor pool. When hunger hits head to the family-style restaurant for your favorite libation and a hearty meal. 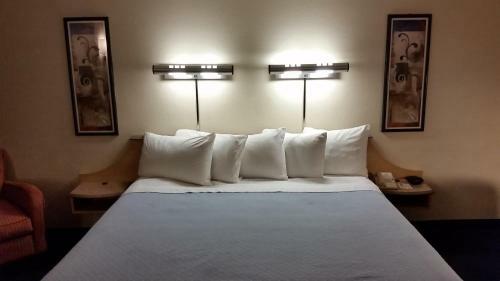 The hotel also features a 24-hour business center and a complimentary shuttle to the Anaheim Convention Center. Parking is free. 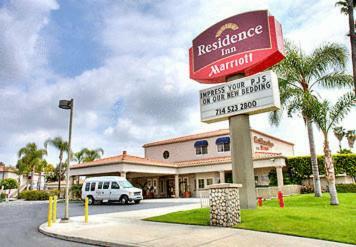 The Holiday Inn is just off I-5 eight miles from Anaheim and 17 miles from downtown Los Angeles. The Anaheim Convention Center is nine miles away and Biola University is within a 10-minute drive. Vacationers are 20 minutes from Disneyland and 10 minutes from Knott's Berry Farm. John Wayne-Orange County Airport is 21 miles from the hotel.